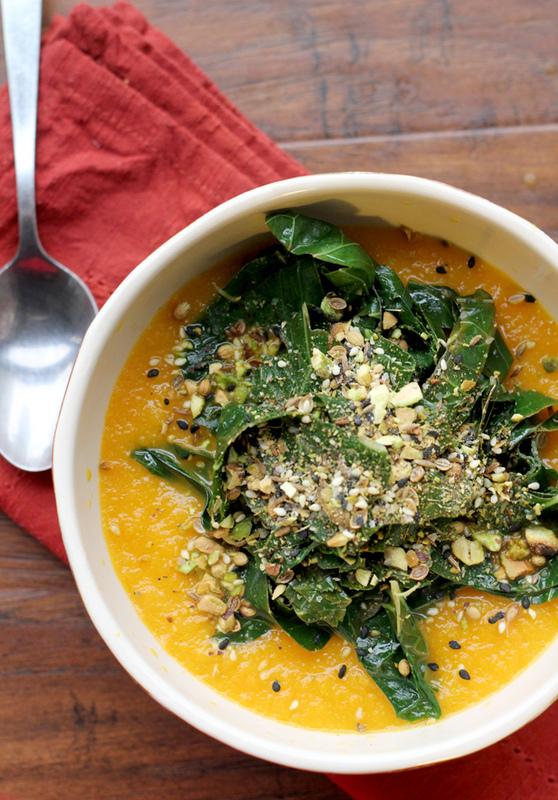 This brightly flavored ginger carrot soup topped with coconut-laced collard greens and Dukkah, an Egyptian condiment made of toasted nuts and seeds, is full of the kinds of great flavor and texture you can crave! I know. You don’t believe me because of all this salted caramel chocolate pepper cookie tart STUFF (aka heaven) I’ve been shoving in your face. So, as they say in every writing class I’ve ever taken (okay…just one writing class. In high school.). There are double vegetables in this soup. So they totally count twice. Carrots and ginger are boiled up together and then pureed into a silky smooth brightly flavored blend. Collard greens are steamed and tossed with coconut oil and lime juice. 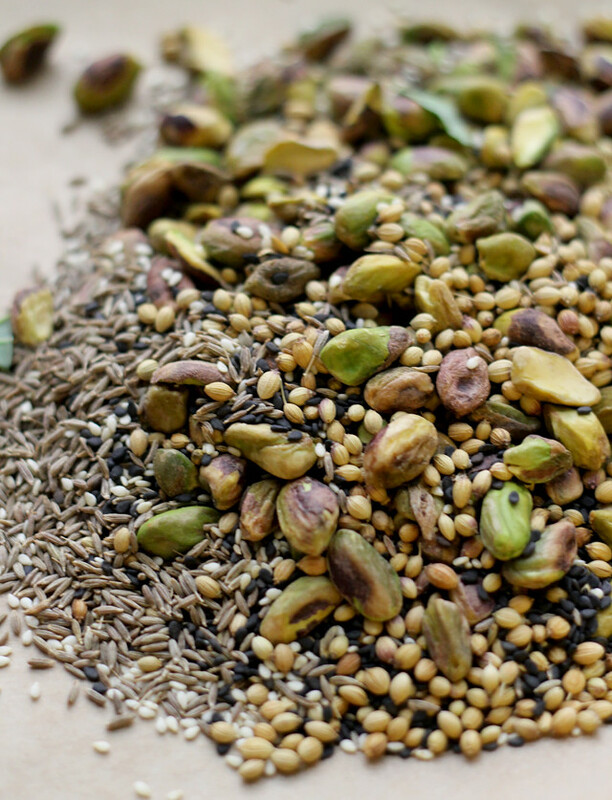 Pistachios, sesame seeds, cumin seeds, and coriander seeds get all roasty toasty in an oven and are then crushed together with a bit of thyme, oregano, salt, and pepper. 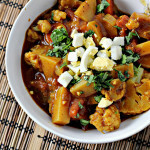 I am submitting this to Deb over at Kahakai Kitchen for Souper Sundays! 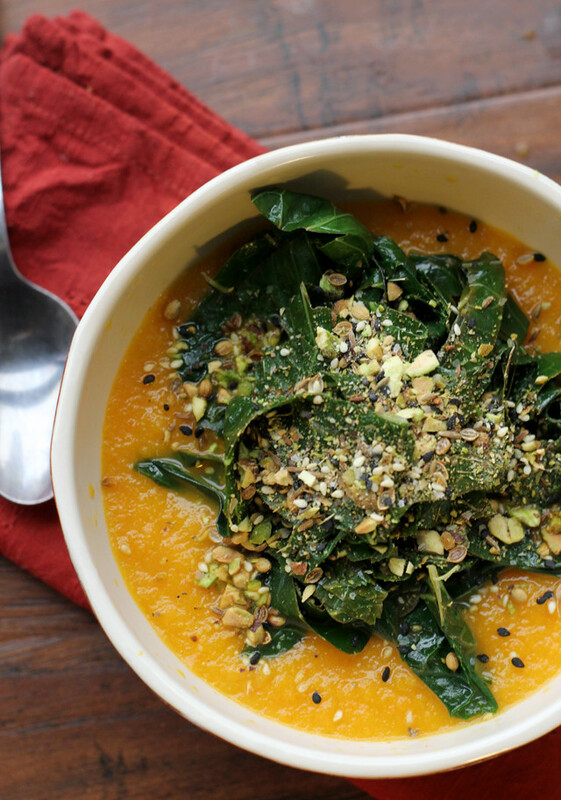 This carrot soup with coconut-laced collard greens and a crunchy nutty spice blend topping is a healthy bowl of big flavor! Heat the olive oil in a large pot over medium heat. add the onion, carrots, ginger, cumin and 1 tsp salt. Cook, stirring frequently, about 6 minutes. Add 4 cups of water and bring to a boil. Lower to a simmer, and cook, covered for about 20 minutes, or until vegetables are tender. While the soup is cooking, remove the collard leaves from the stems. Roll them up and then cut them into thin strips. Put the strips in a second pot with ½ cup water and a pinch of salt. Steam until tender, about 4-5 minutes. Drain and toss with the coconut butter and lime juice. Season with salt to taste. When the soup is ready, puree it until smooth. Season to taste with salt. Serve topped with collard greens and a sprinkle of Dukkah. 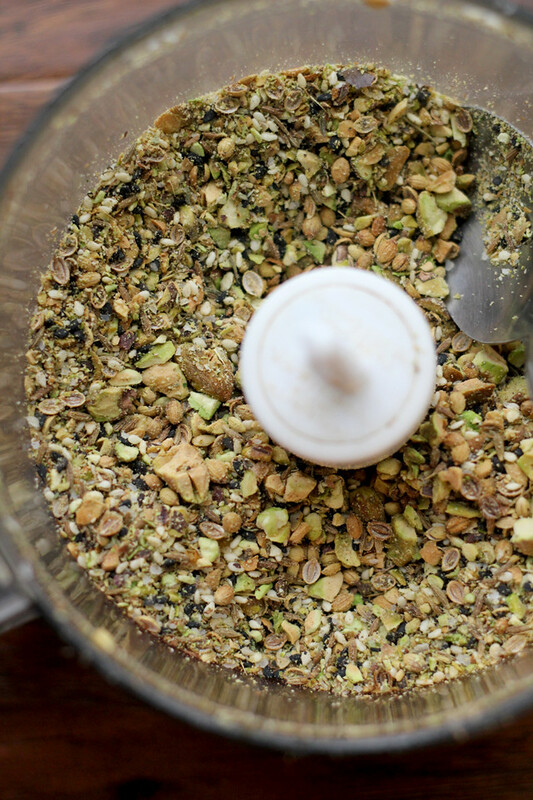 This Egyptian condiment is the perfect topping for soups, salads, eggs, and more! Spread the pistachios, sesame seeds, coriander seeds, and cumin seeds in a baking pan. Toast until fragrant, about 8 minutes. Let cool for a few minutes. 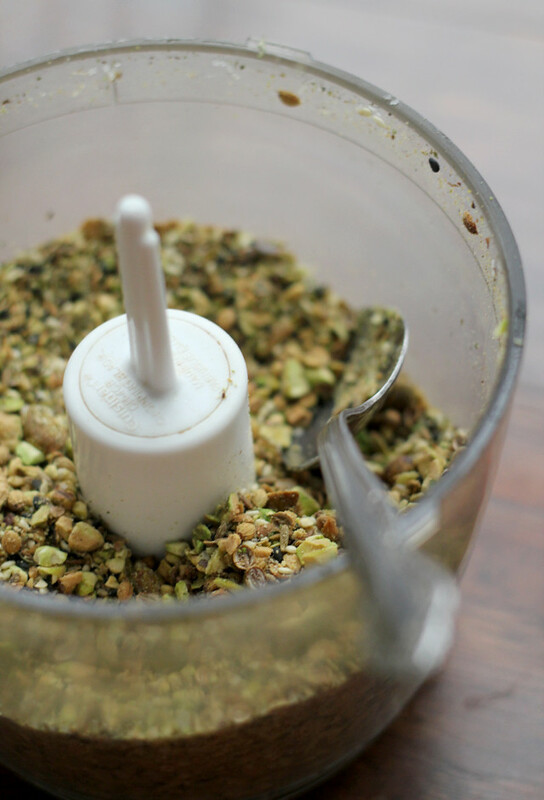 Transfer the nuts and seeds, thyme oregano, and ¾ tsp salt to a food processor. Pulse until roughly ground but still crunchy. Season with pepper. Wonderful soup, Joanne…and the dukkah looks delicious! Love the photos of it. 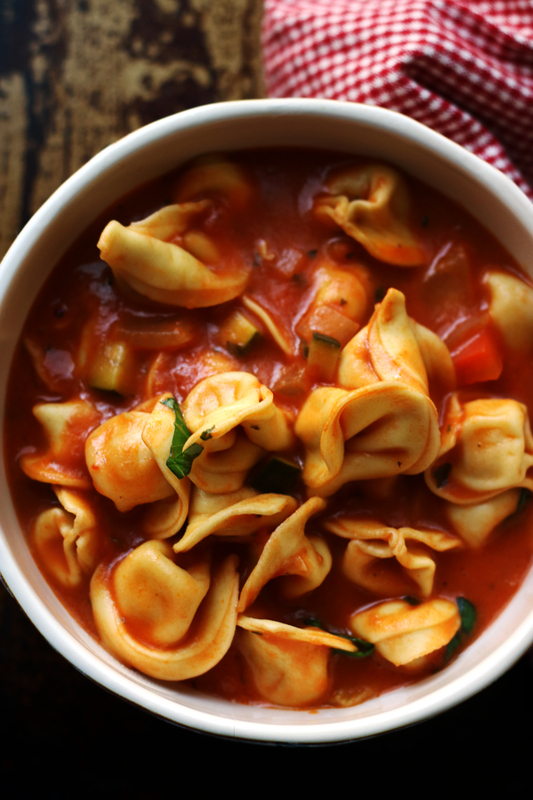 I love how wholesome and comforting this soup looks. I especially love the collard green topping. Thanks for sharing, Joanne! Yes. Yes, I would love a bowl. This is so vibrant, it really makes you want to reach in and grab it. Sounds amazing! I made this a few weeks ago and it was amazing! Deborah Madison’s recipes never fail to be awesome. The collards with coconut and lime were the biggest surprise of the dish for me – so simple, yet so delicious. 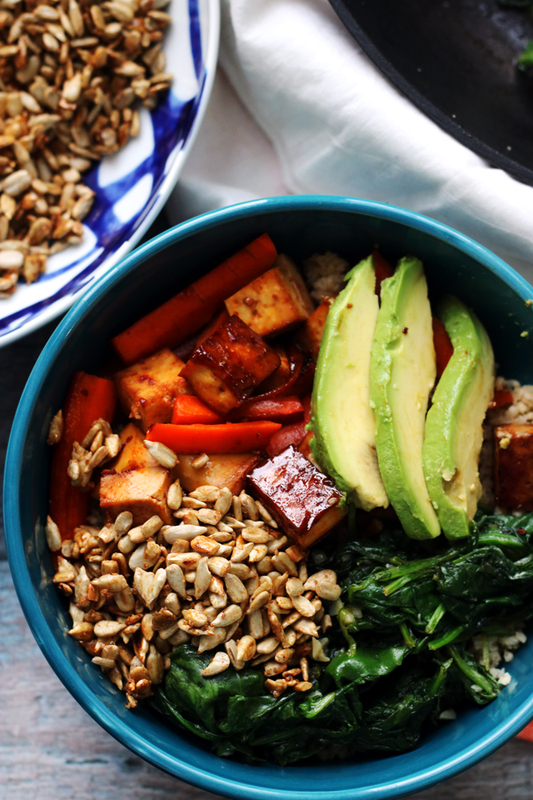 Love this one bowl meal Joanne – dukkah is the best, and I love how you used it to top off your soup. When I serve soup, I like to use lots of different texture, so your creamy, tangling veggies and crunchy topping are right up my alley! I seriously need this soup after everything I’ve been eating the past week! It looks wonderful, and I am so craving vegetables like this! 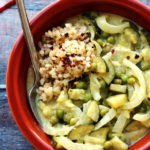 This soup sounds like such a tasty and hearty veggie soup! I had no idea what dukkah was, but now I am intrigued! I love the idea of adding something warm and crunchy atop this creamy soup! I’d never heard of dukkah, but girl, it looks amazing! And so does the soup, the color is gorgeous! Okay…I just made carrot soup last week and I was so proud of myself, until now…it did not look nearly as gorgeous as yours nor did it have these beautiful collards and this dukkah (which I’d never knew of til today). Great job! I’d love a tub of this. It is definitely soup weather here – Ill take a bowl please! I was introduced to dukkah while visiting New Zealand. They used it to dip bread in after the bread was dipped in olive oil. The olive oil helped the dukkah stick to the bread better.Yummy stuff, but I never thought of sprinkling on top of soup. This recipe looks great. great looking soup, the addition of dukkah is brilliant! The soup looks lovely and tasty. I like the added texture the nuts & seeds give this soup. I love the layers of flavor in this soup!!! Especially the nuts! Yay, vegetables! Especially vegetables in warm & cozy soup form! I definitely need some of this very soon indeed. I’ve never had dukkah at all, I think, but am super excited to try it out! 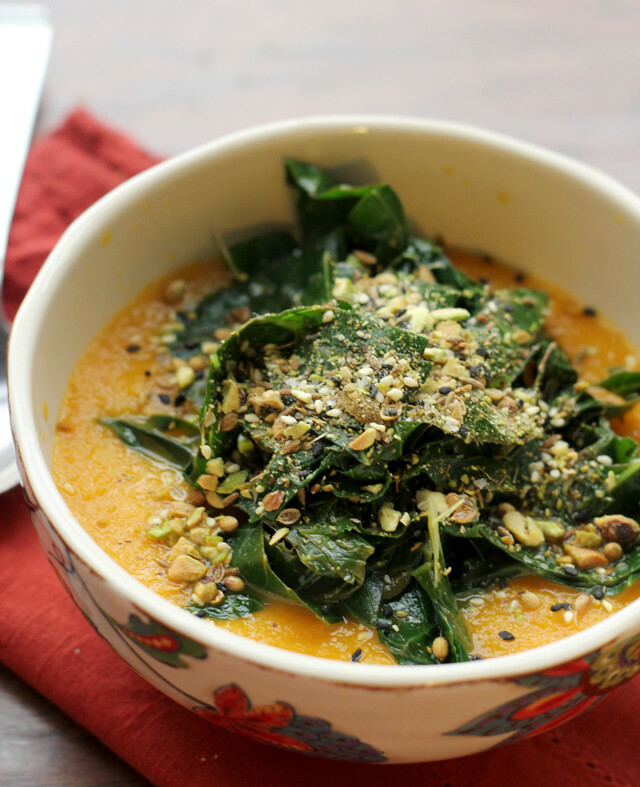 I had some carrot soup with kale today…but yours with nutty topping has made a huge difference! Dukkah! A new vocabulary word for me! The combination of flavors and textures in this soup sound so yummy that I’m hoping to make this on Sunday. While I’m here, I want to take the chance to tell you that the pumpkin and white bean bisque was a huge hit in this house, even though I wimped out and didn’t do the beautiful-looking dill rolls. I’ll try to do them next time I make the bisque, which will surely be very soon! Thanks, Joanne! Great soup! I love Dukkah. I cheat and buy the spice mixture at Trader Joes. That is a beautiful soup. Double vegetable soup totally means I can also eat double desserts. This looks so yummy! 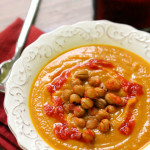 Oh this looks like a great soup Joanne….pretty soon I am going to think that this is a vegan blog. I love it!!!! Have a great weekend! I love this dukkah thing! Pistachios are one of my favourite nuts! I was getting worried about the sweet overload, glad it was all tempered with moderation. 😉 This dish looks so good. I’ve heard of dukkah but never was tempted to try it. Now I am. Thanks for the recipe! This looks awesome — and so unique! The best reason I can think of to eat healthy food is to make room for cookies. Also, because most of the time it tastes great. Have a good weekend, Joanne! I knew you’d never get too far away from vegetables. Great soup that’s perfect for the weather here today, it’s all of 14 degrees! I love the idea of the soup with the collared greens – how tasty and beautiful! why yes I would love a bowl of this. Perfect balance! And, quite perfect flavours. This looks amazing! I would have a hard time sharing this soup! Pinning! i love a good healthy soup and it will definitely make me feel better about some cookie baking today! The flavors in this soup sound absolutely divine and I love all the layered spices and vegetables. Gorgeous recipe Joanne. 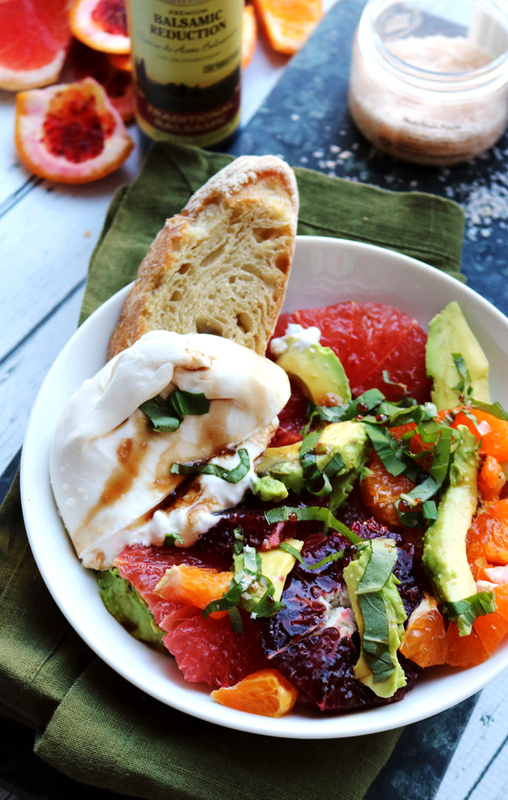 Oh, this looks so good… I could eat it for breakfast! Oh my goodness, Joanne! 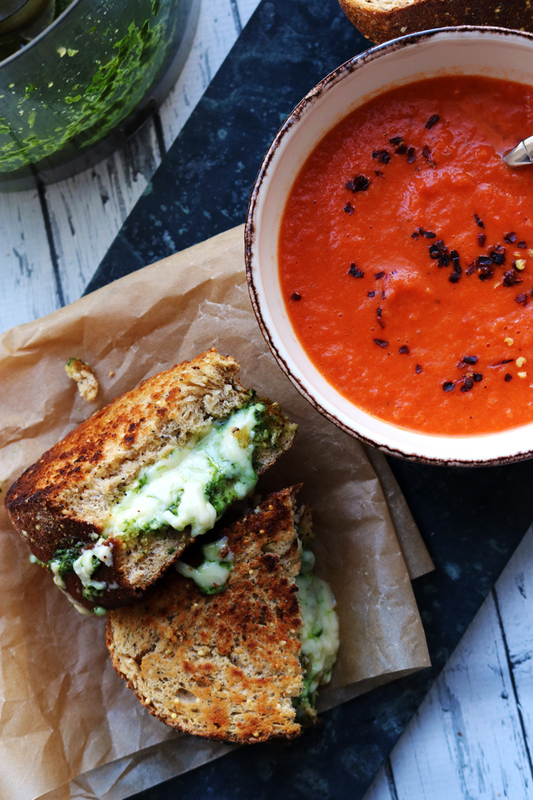 This soup looks stunning….really stunning! I think I might even prefer it to cookies if that’s possible. I’m gonna have to get on the dukkah bandwagon. Deb used it awhile back and piqued my curiosity. I just know it has to be fabulous on soups and maybe on bread and hummus and well I’m sure there’s lots of other possibilities. OMG Joanne – I am making this ASAP – sounds amazing! so healthy. Love it. I’ve never made carrot soup. I adore dukka, and it there is any left over, the key word being “if” it is wonderful with olive oil and bread. 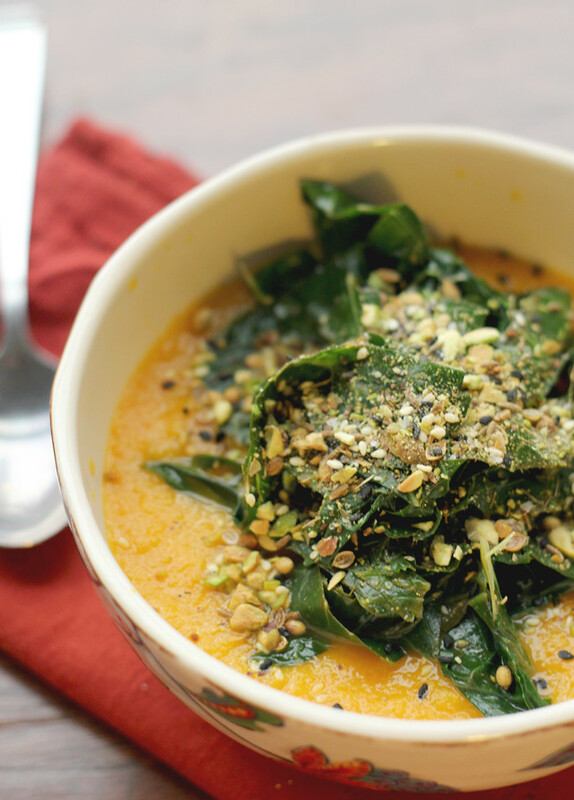 Ooh – I love the idea of adding collards on top of a soup. 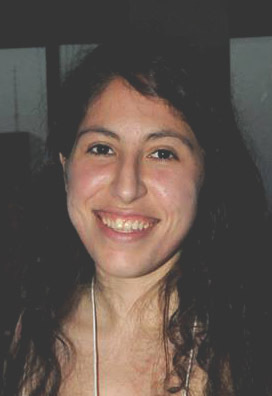 This one is beautiful, Joanne! This recipe has such simple ingredients, but looks like it has a great flavor combo. I’m pretty sure that salted caramel and veggies are the two most important components of a diet! This truly looks fantastic. I am in mood for soups lately and this one would be just perfect!! So healthy and loving the colors!! I’m still trying to figure out if I like collard greens. I tried them at a restaurant the other night and did NOT like them at all. But I’m pretty sure I’ve had them before and loved them. This soup looks lovely, and the perfect thing for the weather right now–it’s even chilly here in Texas! I’m all for moderation and for the great flavours in this soup! Thanks for sharing it with Souper Sundays. What a wonderful combination of ingredients! great looking soup! love the colors! How die you come up with this recipe? I love the colors and the crunchy nuts on top. I’m in need of double vegetables! YUM! What a glorious color! It looks like a bowl of pure sunshine, which I could really use right about now in the midst of so much gloomy, grey weather. My last carrot soup turned out surprisingly lack-luster, so I’ll have to follow your lead on the seasonings next time around. 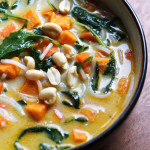 This looks so yummy, I love the color of the soup and the seeds and nuts that you topped it with. This has to be one of the prettiest soups I’ve seen in a very long time Joanne. Gorgeous. Good work, sweet and talented friend! OMG! The soup looks fabulous! I made a ginger carrot soup recently that just didn’t do it for me. I think it was missing the collards and dukkah 🙂 wonderful! That is one gorgeous bowl of soup! All that layering of flavors and textures just drove my taste buds mad with want! Plus I think I kind of just fell in love with that dukkah. I just bought a little jar of dukkah at Trader Joe’s out of curiosity. Love it! The flavors in this carrot soup sound marvelous. Great contrast in colors and textures with this soup. I suppose one could buy already prepared dukkah to save time with this recipe. I’m drooling already! This is the most gorgeous soup in the entire world!! Stunning soup filled with nuttiness and love! This bowl of soup looks so enticing! I am so in the mood for a warm soup right now, and this one would definitely hit the spot. perfect!